Christmas was spent at Brian’s parents where we played games, ate good food and I improved my disc golf game. 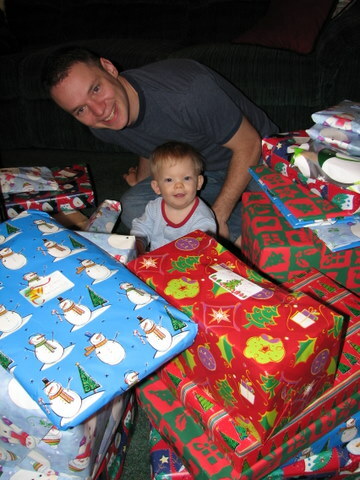 Christmas morning started with their traditional barricade – only this year we told Benj. wake up time was 5:00am instead of 4:00. 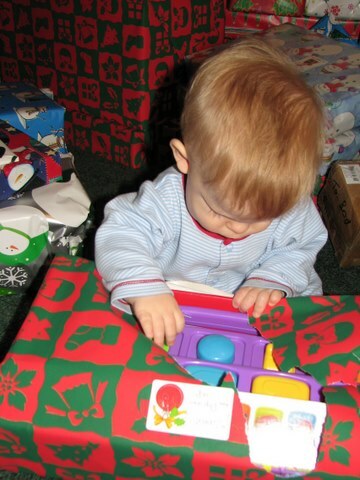 He did actually manage to get his toys mostly opened and had plenty of help in figuring out how each new thing worked. 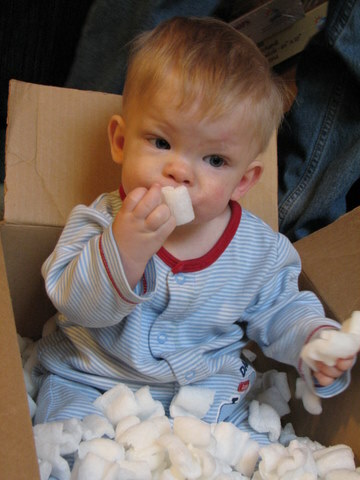 Of course, I think his favorite was the packing peanuts. Coming back from a nice vacation, Brian and I were both sick at the beginning of last week – I was at the end of my fight with the illness but Brian was just starting up. We spent some days laying around the house watching our new Christmas movies. New Years eve we were starting to recoup so we cleaned the house in an attempt to finish off any germs, watched a movie then hit the sack early. Lance started on his resolutions early by cruising that evening! He is really excited about this new skill and was entertained for half an hour last night going from the bathroom door frame to the edge of the cabinet. And here’s Lance showing off his other form of mobility while enjoying a banana – this kid is talented!